Charlotte Gann’s Noir follows in the wake of her pamphlet The Long Woman (Pighog, 2011) and some of the poems from that pamphlet reappear in the full collection. In an interview for Poetry Spotlight Gann acknowledges that the ‘seeds’ for Noir were in those poems and by the time of the full collection, she had found a shape, ‘an envelope’ to contain them. The resulting ‘envelope’ is derived from the concept of ‘noir’ with its various associations. Certainly, my initial and predominant reading of it is in relation to ‘film-noir’. ‘Film Noir’, literally ‘black film or cinema’ was a name given to a certain type of American film by French film critics in the mid-1940s. You would expect these to have a look that was as dark and downbeat as their subject-matter and a mood of anxiety and pessimism. Stock types ( stereotypes) were the cynical hard-bitted male detective and the beautiful femme-fatale whose overt and manipulative sexuality meant that she had to be destroyed, actually or in some other way, according to the film-makers’ ‘moral’ universe and expectations of the public. Noir story-lines were often circuitous and fragmented and the films were shot in greys, blacks and white to reflect the emotional tenor. Straightens things under a white tent. This connects with other allusions to men who kill women and links with the title of the book’s third section, ‘The Bloody Chamber’, which is named after the Angela Carter version of the tale of Bluebeard who murdered his wives. Maybe we can read the ‘Old Wives’ of the poem of that title who ‘weep and smoke and whisper secrets’ as the spirits of murdered women, ‘He’s a terrible man, terrible …’ and tellers of truths rather than of false tales. It is indeed a ‘terrible’ man who appears in the poems – in narrative terms he is a lecturer of astronomy, who, from the podium proclaims, ‘Dark matter is determined by the mass / of objects’, (‘Cluster’). Interspersed are stanzas depicting a woman, as inert doll, ‘She lies on the bed staring upward’, not dead, but could be, though later, and maybe surprisingly, she finds a kind of energy in the anticipation of pouring herself a drink , ‘her tongue tingles’ and being able to ‘go / and sit at her desk’. Is this the poet/detective again, at once in the plot as victim then stepping out of it to become author of her own narrative? Gann’s default style is clear and suggestive, a conflation of the commonplace and the sinister. Pronominal and scenic shifts keep us at a distance although while the immediacy of the language draws us nearer. The ‘push and pull’ tensions are integral to the design of the collection. Woman?’ he asks. She remembers only The Collector. Both novels feature male ‘collectors’, of fossils and butterflies respectively, males who are obsessed with a woman. In ‘The Collector’ the protagonist drugs and kidnaps a woman, literally and metaphorically pinning her down as he does his specimens, a terrifying allusion from which the collection draws an atmosphere of suppressed terror and a technique of ‘camera swerve’ from voice to voice, scene to scene. I was particularly intrigued by the poem ‘Mrs Coulter’s Scissors’ and its contribution to the pervading theme of ‘inadequate’ mothers. Aims, strikes, finds a hacking like severing dough. The child’s much quieter now; at times even pretty. And who’d have thought it? Yet the daemon continues, evident in the third part as the ‘creature lumbering along / the beach, half woman,’ in another part of the world, (alluded to earlier in the female ‘victims’ in ‘On The Tide’, ‘a broken shell, lying in the wet grey / sand’ ) will not, or cannot be suppressed. Connected, I think is the ‘Great news!’ of the brother in ‘Molecular Biologist’, who relates his findings about ‘Cold mothers / … the carriers of autistic genes’ to his sister, as he has already done to their mother who apparently replied ‘I was your classic cold mother’. Broadly the poems draw on precedents where women, in some way, bring about their own destruction, literal or metaphorical, by being too sexual, or independent; in short, not fitting any mould ascribed to them by men. Suggestions of motherly abuse or lack of care are interesting additions to how we might ‘read’ presentations of women (and men) in the poem. Gann does not stretch the point but it adds another unsettling layer. I liked the more experimental forms of some of the poems: ‘The Letter’ draws on structural conventions of both poetry and prose and adopts the layout of a letter the contents of which are alluded to from time to time but never fully revealed. There is a series of ‘marker’ poems, all titled as Dreams (I-VII), one in each of the first four sections, three in the final section. There are risks in determining poems as ‘dreams’ as they might be taken as diversions into somebody’s unconscious for the sake of it rather than serving the collection’s ‘arc’. This isn’t the case here as the ‘dream poems’ earn their place; their tone and imagery draws from other poems so they add coherence to the collection’s scheme rather than diverting from it. Freud’s ideas relating to the ‘return of the repressed’ and of ‘the uncanny’, (in dreams or more generally) are inherent in ‘film noir’ and could help orientate a useful reading of the poems in Noir. 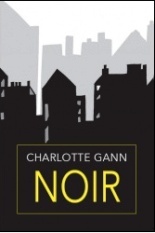 Noir is a handsomely designed book: the cover with its image of looming dark buildings, the weight of its cream pages. Gann has said that this is a work about anxiety and to this reader, it nails it. Anxiety makes us fear being out of control. It keeps us vigilant, hyper-tense. This atmosphere prevails in many of the poems in an accomplished, if unsettling, debut collection. Oh, what an excellent idea for a poetry collection! What an excellent idea for a poetry collection!